Mandriva was one of the most famous names in the Linux world just a few years ago. Unfortunately, the company behind that Linux distribution had some difficulties that inevitably created issues for the project. Mandriva Linux also became a base for several offsprings, derivatives, and forks. Even though the Mandriva project is no longer in its famous state, derivatives still continue their existence. The most famous of them is, of course, Mageia. I used to use Mageia versions 1 through to 5 for some time until I migrated to Ubuntu-based distributions because of some 3rd-party dependencies. ROSA is a Linux distribution that was also forked from Mandriva some time ago. I reviewed it back in 2012, when ROSA Marathon 2012 was released. Since then, ROSA released few more versions and the most recent of them is ROSA Desktop Fresh R7. It has been available since January 2016. Unfortunately, only the KDE version is listed on the official Download page, although a GNOME version is also available. You can download this distribution either from the Download section of the ROSA web site or via torrent. I would recommend to use this link to see all the download options you have. If you don't want to bother with downloading and making the disk, you can order one from the BuyLinuxCDs site. 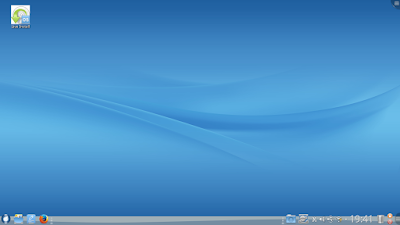 The ISO image of the KDE versions of ROSA Desktop Fresh R7 is 1.9 Gb in size. I burnt it to my USB stick. The USB stick is in the port of my Toshiba laptop. Reboot. Choose to boot from USB. Let's go! The boot process of ROSA Desktop Fresh KDE R7 is similar to Mandriva. First you need to choose between Live run, Install, and Troubleshooting options. I selected the Live run. After that I got several questions about language, timezone, keyboard layout and so on. The keyboard choice from the boot sequence is correctly set for the Live session, which is not always the case for other distributions. Booting took some time to finish and eventually I landed on the default desktop. The default desktop wallpaper of ROSA R7 KDE is in blue tones with some lines on it. There is only one alternative to that wallpaper. The only icon on the desktop is for the installation of the operating system. 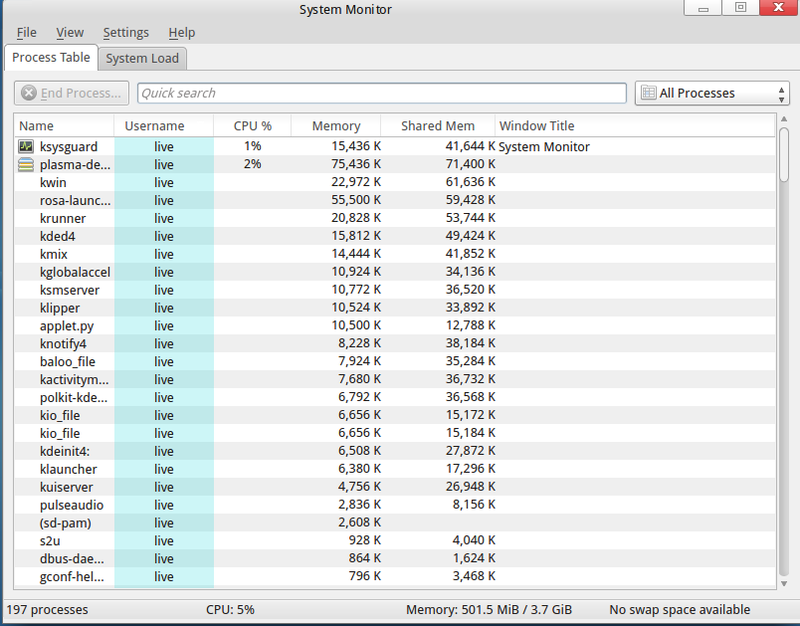 Apart from that icon and a usual configuration thingie in the top right corner of the screen, your desktop is clear. The panel at the bottom of the screen has a menu button on the left together with shortcuts to File Manager, Firefox browser and LibreOffice Writer next to it. The right part of the panel contains shortcuts to system settings and Downloads, along with a notification area. That notification area contains clocks, recycling bin, network, volume and USB indicators, switch-off button and so on, more or less a usual set. The design of the panel is that the top part of it is transparent. That makes the top part of shortcuts "stick out" above the panel itself. However, the maximized windows don't take this space, which looks a bit odd. At the same time, the indicator icons in the notification area are fully within the panel background. It makes the overall look of the system inconsistent. The freshly booted system took just over 500 Mb of memory. 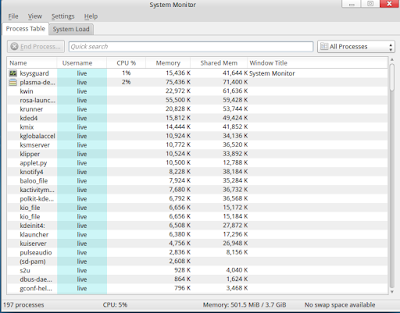 That's quite a few even for the KDE 4-based distribution. ROSA uses its own menu that takes the whole screen and covers all the windows when you click the menu button. There are no sections in the ROSA menu, but only "Welcome", "Applications" and "Timeframe" tabs. You can search for the applications by typing in their names in the search field. It makes the ROSA menu similar to the Dash concept of Ubuntu, but Dash still allows you to see some part of the desktop content. ROSA Desktop Fresh KDE R7 correctly recognized and configured my wireless network card Realtek 8191 SEvB. The click on the network indicator on the panel gave me a list of networks in the vicinity, and I only had to select my network and type in the password. The Samba Shares shortcut in the Network part of the Dolphin file manager allowed me to easily find and connect to the shared network drive that I have. I was able to open various files from that network drive. The NTFS partitions of my local HDD were also visible and mountable in the Dolphin file manager. I have already mentioned that the boot process contains a question about the keyboard layout you want to use. Since I was running the KDE version of ROSA Fresh Desktop, I had no problems with configuring the alternative layout the usual KDE way. There are not many applications that come with ROSA. Firefox 43.0.4 and Chromium 47 browsers are in the distribution. Chromium comes with Google Docs extensions while Firefox does not have any add-ons. Other Internet tools include Kopete instant messenger, KTorrent, KRDC remote desktop access and Thunderbird email client. LibreOffice 4.4.7.3 is the representative of the productivity tools. It has a dedicated folder in the ROSA menu and includes Calc, Writer, Impress and Math components. There is also the Ocular document viewer. KSnapshot, GIMP, Gwenview and Kolourpaint would probably be enough even for the experienced graphics user. Kdenlive video editor, K3B disk burning tool, Kamoso web camera, ROSA Media Player, Audacity and Clementine are the multimedia utilities. Three games: KPatience, Kolour Lines and KMines are in the Games subfolder of the ROSA menu. There are some ROSA-specific applications available for you. 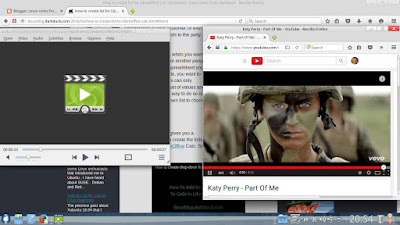 Apart from the above mentioned ROSA Media Player, you also have ROSA Image Writer and ROSA Freeze. I am not that clear about the purpose of the latter, so I’ll let you decide for yourself about it. There are smaller utilities like GParted, Ark, Konsole, KCalc, KWrite available out of the box. ROSA Desktop Fresh KDE R7 has its own Software Management tool (RPMDrake 5.6). It allows you to search and install new packages. I tried to find some, and all of those I tried were available in the repository or already in the system: Transmission, Skype, Pidgin, Kate, mc, cifs. Firefox gives you a warning about the Adobe Flash version when you try to play a video that requires Flash. You can enable it by clicking the red brick icon on the left of the address bar in the browser. Chromium browser does not have this issue and starts playing the videos on the same pages straight away. Clementine is the default player for the MP3 files. When I double-clicked the file from the network partition, the file had to be copied to the local machine first. That process failed and I could not play the file in Clementline. ROSA Media player did not have this problem and started playing the file immediately. ROSA Desktop Fresh R7 KDE left a good impression on me. Even though the initial boot took about 500 Mb of memory, my laptop with 4Gb of RAM was capable of dealing with all the tasks I ran on it in the Live mode of this distribution in a quick and responsive manner. I felt no lags or glitches. The only minor things that were worth mentioning in this review were strange design of the panel and the ROSA Menu which isn't to my taste. Well done, ROSA team, I hope to see your system even more improved in the future.